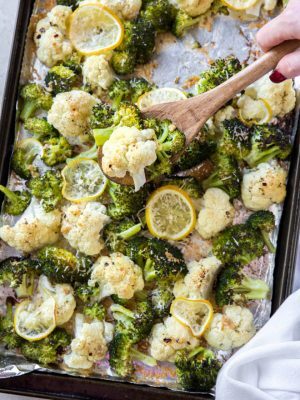 Roasted broccoli and cauliflower with lemon and garlic is a healthy side dish that’s ready in no time! Combine a few simple ingredients together and roast in the oven for 20 minutes. It’s that easy! 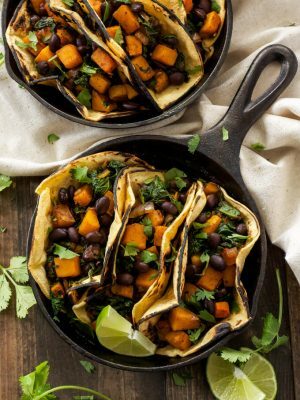 Easy weeknight meals are the best! One pan meals are even better. They are easy to prep for the weeknight and require little clean up. 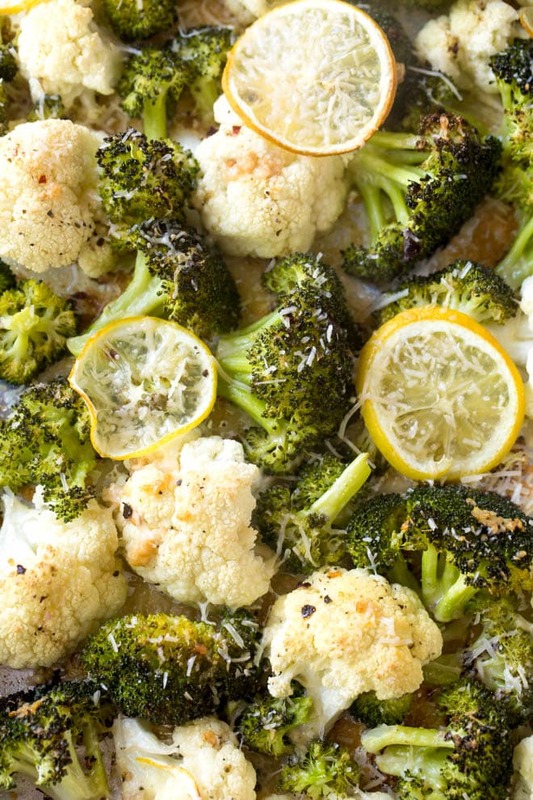 One of our favorite easy dish dish recipes is this roasted broccoli and cauliflower recipe. It’s the perfect clean eating recipe for any day of the week. 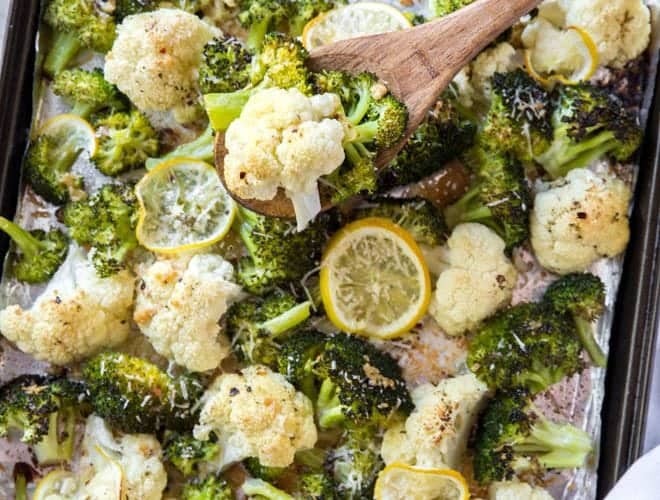 The simple side dish combines a few ingredients like garlic, lemon, Italian seasoning and olive oil with oven roasted broccoli and cauliflower. Add freshly grated Parmesan cheese for additional flavor. Broccoli and cauliflower cook together quickly and easily. Combine broccoli and cauliflower together in a large bowl. In a small bowl, whisk together olive oil, salt, pepper, minced garlic, Italian seasoning and lemon juice. Pour the mixture over the fresh vegetables and stir. 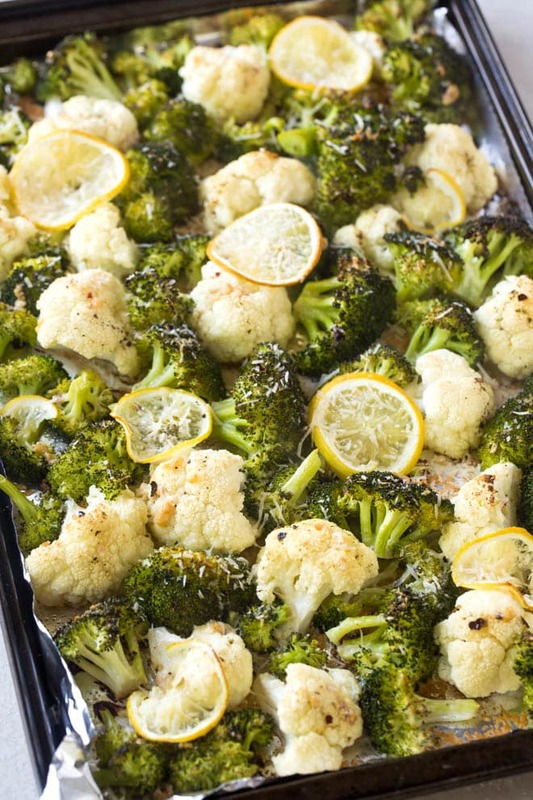 Spread the broccoli and cauliflower out on a large baking sheet. Make sure the veggies do not over lap. Keep them in one layer. Add an extra lemon slice for fresh lemon flavor and sprinkle Parmesan cheese over the top, if desired. You can omit the Parmesan cheese to make it vegan. This recipe tastes great either way! How long does it take to roast broccoli and cauliflower? 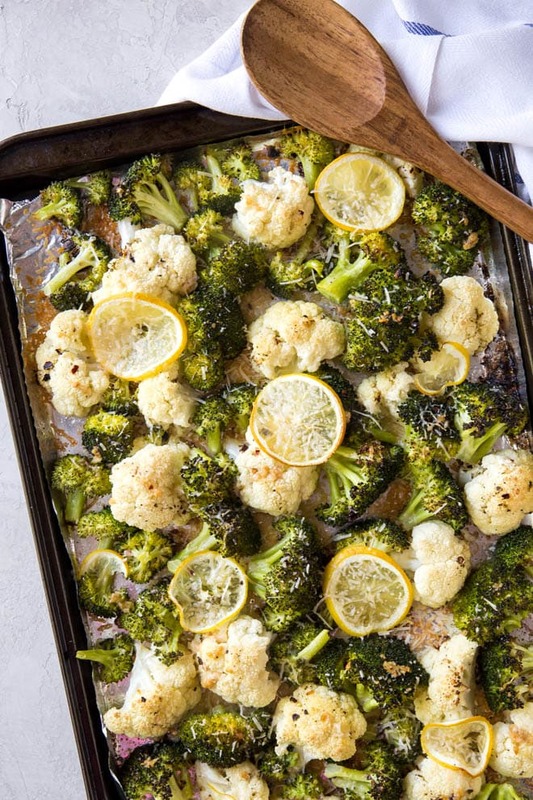 Roast broccoli and cauliflower together on the sheet pan for 15 to 20 minutes at 425 degrees F. You can also roast at 350 degrees F for 30 minutes. 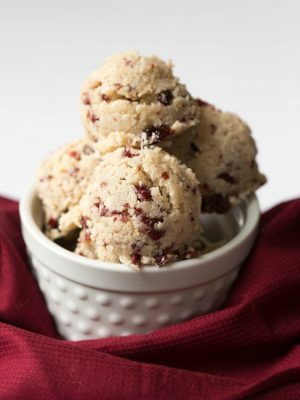 What can I make with cauliflower and broccoli? We love making this roasted cauliflower and broccoli as a side dish. Serve with chicken or any other roasted or grilled meat. Or create a super simple and easy one-pan dinner. Season chicken tenders or cut up chicken into 1’ cubes. Place them on the pan with the broccoli and cauliflower and roast in the oven. Everything cooks within 25 minutes! Both cauliflower and broccoli are very nutritious. Broccoli florets provide minerals fiber content. They also contain high amounts of Vitamin K and Vitamin C. Broccoli offers more protein than many other vegetables. In addition, cauliflower provides vitamins, fiber, fatty acids and more. Combine broccoli and cauliflower for a nutrient-rich meal. If you’re looking for more broccoli and cauliflower recipes, try a few of our favorite recipes. Broccoli and Cauliflower Casserole, Lightened Up One Pan Chicken and Broccoli Fettuccine Alfredo, and this Broccoli Chicken and Cheese Wild Rice Casserole make an appearance on our dinner menu often. 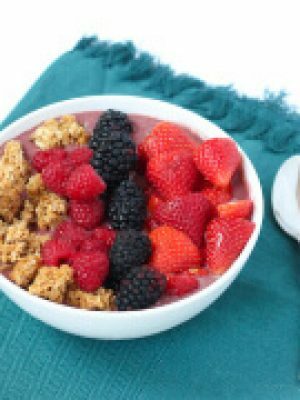 We love that this recipe is healthy and easy! You can easily adapt the recipe to fit your taste. Omit the Parmesan to make it vegan or make parmesan roasted cauliflower by omitting the broccoli. Enjoy it any day of the week as a simple side dish. 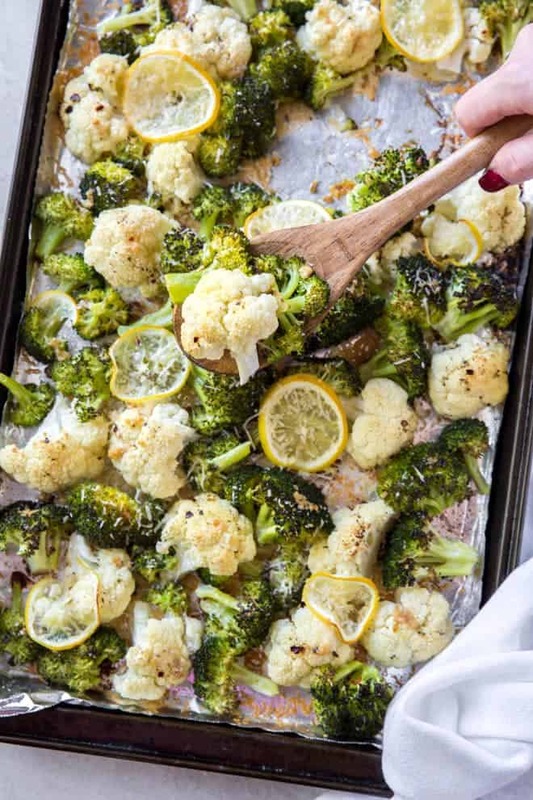 Roasted Broccoli and Cauliflower with Lemon Garlic is a simple dish that tastes great with chicken, salmon and more! Preheat the oven to 425 degrees F. Combine broccoli and cauliflower in a large bowl. In a small bowl, stir together olive oil, salt and pepper, minced garlic, Italian seasoning, and lemon juice, Pour mixture over veggies and toss to coat well. Cook in a preheated oven for 15 to20 minutes, until veggies are fork-tender and begin to brown on the edges. Serve immediately. *Nutritional information does not include optional Parmesan cheese. Adding the parmesan cheese would alter the nutritional facts. A good non-stick sheet pan is an essential tool in every kitchen. This recipes cooks on one sheet pan to make clean up easy too! Use a lemon juicer to remove fresh lemon juice from lemons. A garlic press is the most used kitchen tool in my kitchen. Freshly minced garlic tastes amazing! So flavorful and delicious! I love roasted vegetables but this brings it up to a whole new level! Hi, Alyssa! Thank you so much for your review. It's one of our favorite easy side dish recipes.